I am not a morning person. It is something I am constantly working on… especially when Back to School time rolls around. Gone are the days of sleeping in and staying up late. We are up with the rooster and breakfast is fresh on the minds of the kids when they hit the floor. 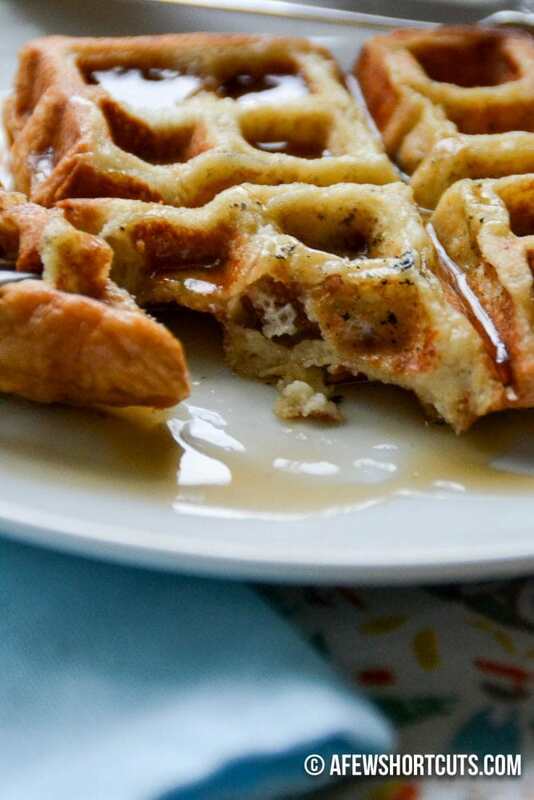 These Bacon Stuffed French Toast Waffles hit the spot and then some. I love sitting down and having a full breakfast with the kids. September is the National Family Meals Month. A family meal is so important, and it doesn’t just have to be dinner. Family meals eaten at home have been proven to benefit the health and wellness of children and adolescents, to fight obesity, substance abuse and to make families stronger – creating a positive impact on our communities and our nation as a whole. I take pride that my kids expect a family meal around the table. It is the basis for a strong family. 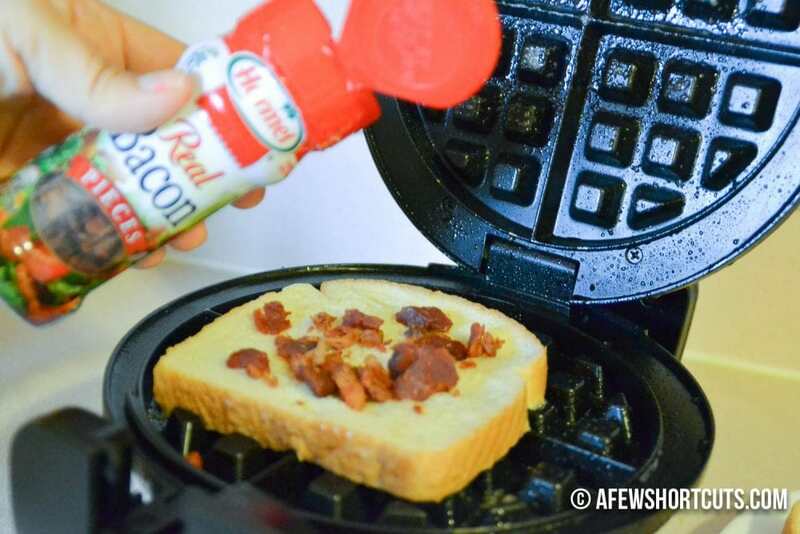 The secret to getting these Bacon Stuffed French Toast Waffles on the table quickly are these Hormel Real Bacon Pieces. I keep them on hand for this reason. I don’t have to worry about cooking bacon. These are perfect to sprinkle right in and add a special touch! Visit Easy Recipe Ideas for more great recipes using Hormel products. Also Visit Hormel Foods to check out all of their great products. I whipped up the milk/egg mix. Then I dipped 1 slice of bread in it. 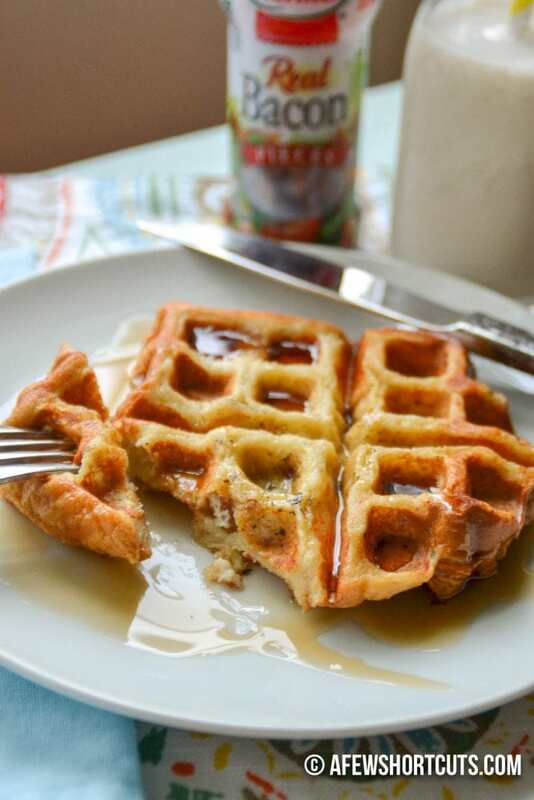 Spray down the waffle iron with non-stick spray. 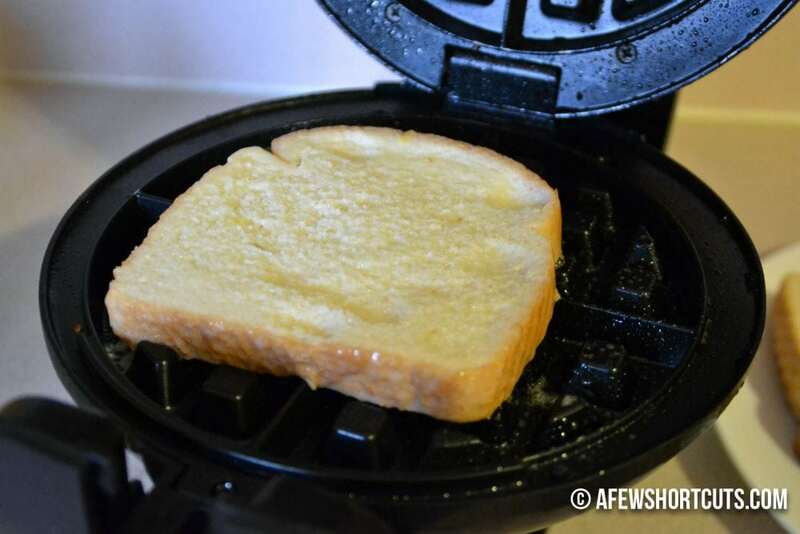 Place that dipped bread right on the hot waffle iron. 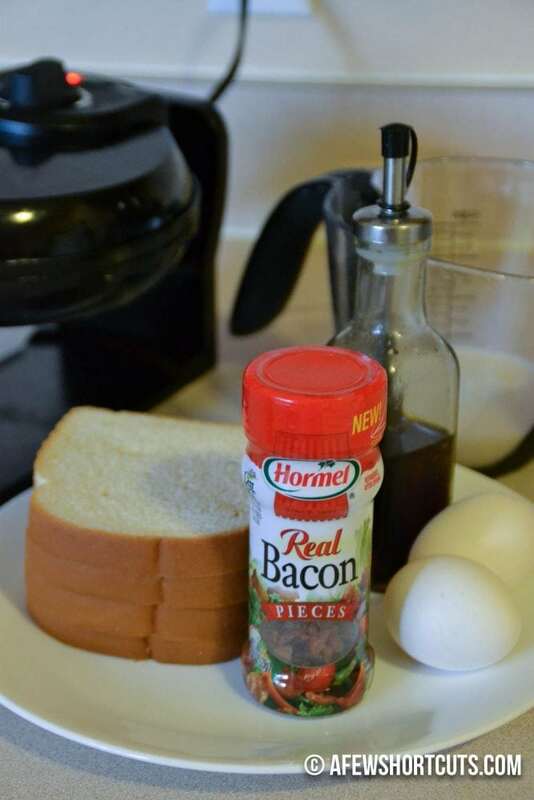 Sprinkle with some Hormel Real Bacon Pieces. Then top with a second piece of dipped bread. Close the waffle iron and let it cook for 2 -3 minutes. When you open it you get this perfect Bacon Stuffed French Toast Waffle. Flip it out onto your plate and drizzle with syrup. Y’all it doesn’t get any better than Bacon Stuffed French Toast Waffles. This is the king of breakfasts! 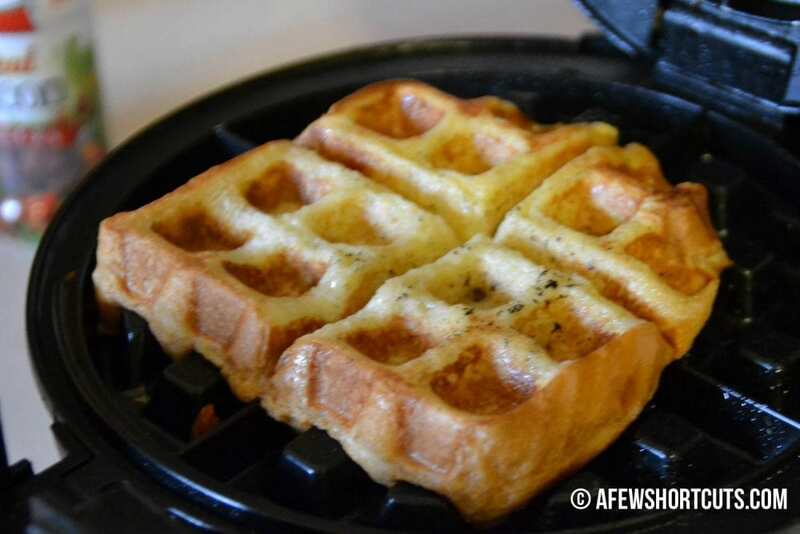 Plug in waffle iron to heat. In a bowl whisk together milk, egg, sugar, and vanilla extract. Spray the waffle iron with non-stick spray. Dip a slice of bread into the milk mixture. Just enough to coat. 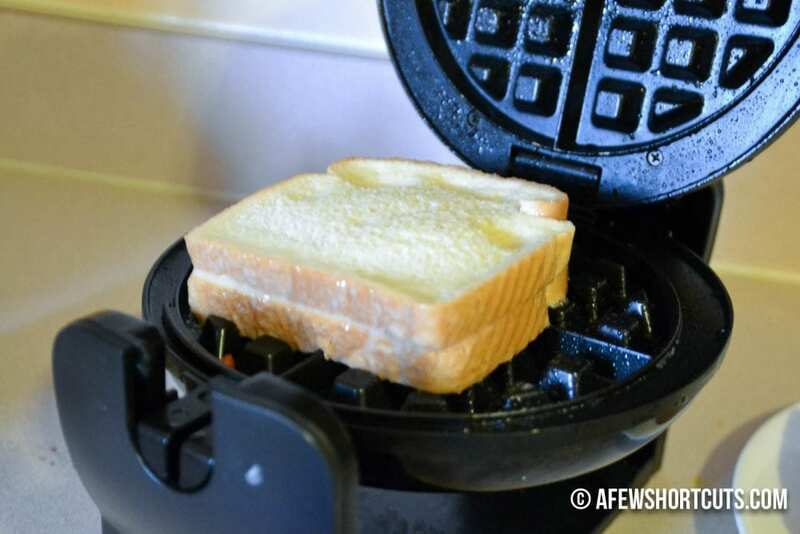 Place the bread onto the hot waffle iron. Sprinkle with Hormel Bacon Pieces (about 1 tbsp). Finally dip a second piece of bread into the milk mixture and place it on top of the first. 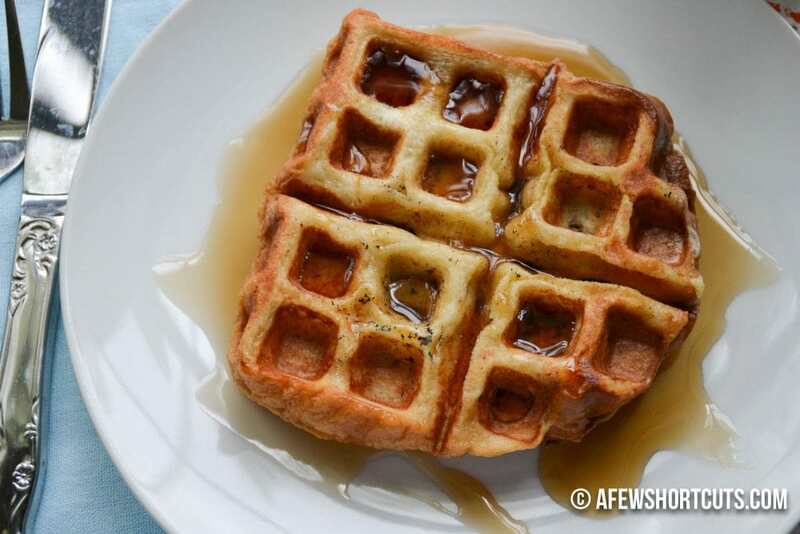 Close the waffle iron and allow it to cook for about 2-3 minutes or until golden brown.